Category: Book Design & Birthday Card Design, Co. Mayo, Ireland. 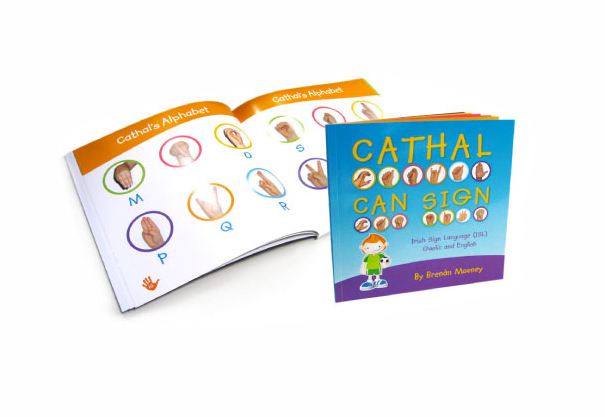 First time author Brenan Mooney came to Designwest to help turn her idea for a children’s book design incorporating Irish Sign Language, Gaelic, and a little boy named Cathal, into a reality. Designwest worked with an illustrator who helped develop Brenan’s own originally created characters of Cathal and his family members, and combined with photographs of Brenan’s son Daniel demonstrating the ISL hand positions, we designed the book in a colourful, easy to follow format that teaches the ISL alphabet and basic vocabulary words such as numbers, colours, days of the week and family members. The book design has received excellent feedback, currently being sold in bookstores around Ireland, as well as on the website, www.cathalcansign.ie, which Designwest also created. Along with the book design, Brenan had the idea to produce a line of birthday cards which uses the ISL signs for the age number, and words ‘Happy Birthday’ in a range of vivid colours. Tagged with: Book & Birthday Card Design, Book Design, Cathal Can Sign, Co. Mayo, Ireland.